Subtitle Editor is a GTK+2 tool to edit subtitles. It can be used for new subtitles or as a tool to transform, edit, correct and refine existing subtitles. This package has this features o Multiple document interface. o Internationalization support. o Video player integrated in the main window (based on GStreamer). o Can play preview with external video player (using MPlayer or other). o Style Editor. o Move subtitle. o Scale. o Split and joint subtitle. o Edit text and adjust time (start, end). o Generate Wavefrom From Video. Sub Station Alpha. o Advanced Sub Station Alpha. o SubRip. o MicroDVD. o MPL2. o MPsub (MPlayer subtitle). o SubViewer 2.0. o Plain-Text. o Adobe Encore DVD. After installation, start it under Applications -> Sound & Video -> Subtitle Editor. 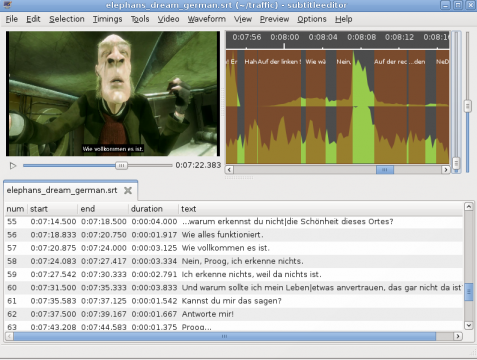 1 user responded in " Subtitle Editor – A subtitle editor based on GStreamer and GTK+ in Ubuntu "